Great News for all. Gujarat police Constable Exam Date 2018 | Gujarat Police bharti 2018 Exam date. Today Gujarat police Recruitment board release pressnote regarding Gujarat police Constable Exam date 2018. Gujarat police bharti 2018 exam date. 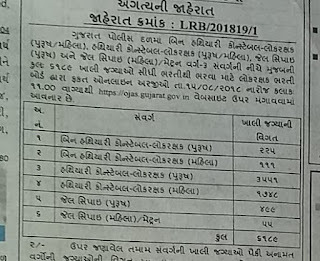 So Gujarat police Constable exam will take at 28th October 2018. Basically Gujarat police Constable bharti 2018 exam date or Gujarat police Constable exam date 2018 declared through official paripatra. So may change in future. But if you want to become Gujarat police Constable then you have to prepare for Gujarat police Constable exam date 28th October 2018. Also Gujarat police Constable physical test will take in December/January month. For more details download Gujarat police Constable exam date paripatra 2018. 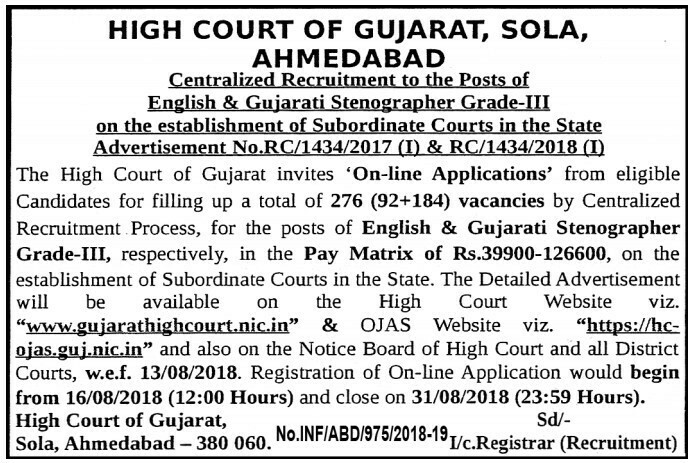 As we said above Gujarat police Recruitment board will take Exam of Police Constable bharti 2018 at 28th October 2018. So now 2 moths remaine for Gujarat police Constable exam date 2018 or Gujarat police bharti 2018 exam date. For police Constable Ground exam date also mentioned in this paripatra that Gujarat police Constable physical test exam date 2018. Gujarat police Constable exam date 2018 and Gujarat police bharti 2018 exam date. 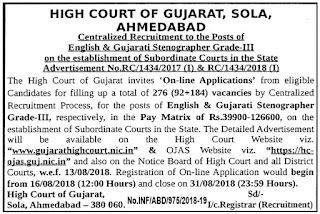 Basically this article is aiming that all police Constable bharti applicants are waiting for Gujarat police Constable Exam date 2018 and Gujarat police bharti 2018 exam date. So this post gives you exam date of police Constable bharti. Daily Visit www.GyanGujarati.com website for new model papers, law material. 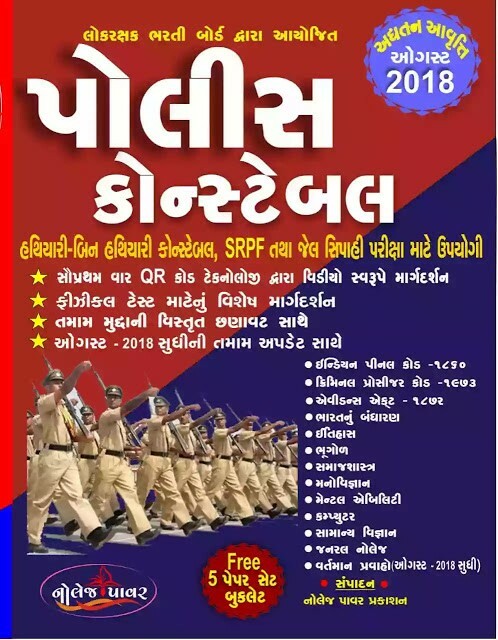 Gujarat police Constable Exam Syllabus 2018. Gujarat police Constable bharti 2018 question paper contains 100 objective type questions (Mcq) each of one marks and total marks of Gujarat police Constable bharti 2018 is 100 marks. And 0.25 nagetive marking system applied for each wrong answers. Question paper of Gujarat police Constable bharti is in Gujarati language. Gujaratujarat police Constable old papers and Gujarat police Constable model paper is provided soon on Gyangujarati.com website. Gujarat police Constable bharti 2018 exam date or Gujarat police Constable exam date 2018 declared. 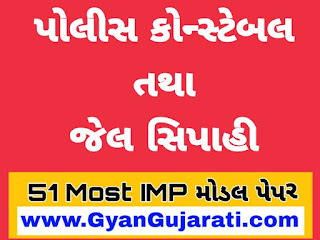 Most IMP 51 Gujarat police Constable Model paper 2018 PDF Download. 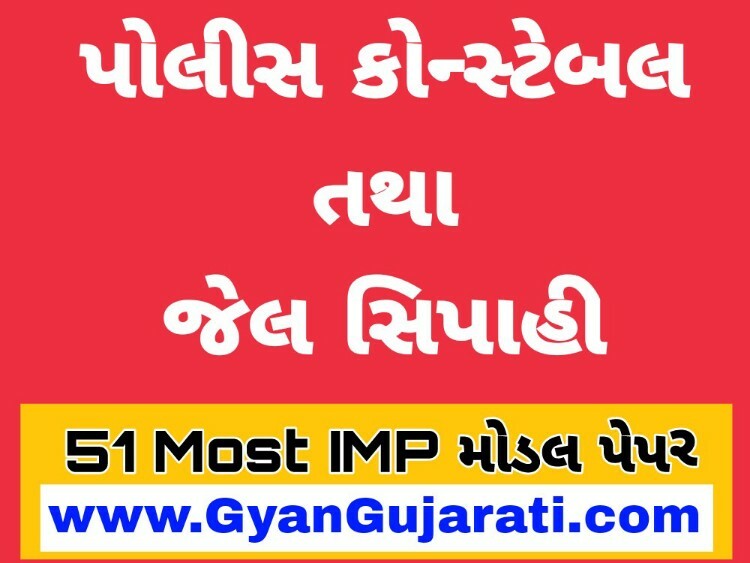 Here www.GyanGujarati.com provide Most imp 51 Gujarat police Constable model paper for Upcoming Gujarat police Constable Exam 2018-2019. 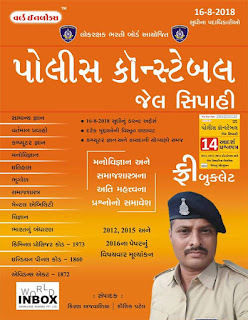 So Download all Gujarat police Constable model paper 2018 pdf download. So you can score well in Gujarat police Constable Exam 2018. For more Gujarat police Constable Exam materials you can visit www.GyanGujarati.com website. Gyangujarati.com is very famous website for Gujarat police Constable Exam materials and PDF Materials, model papers. More information about Gujarat police Constable Exam Syllabus. Are you searching for Gujarat police Constable Exam materials and PDF Materials. Then from www.GyanGujarati.com website you find all topics material such as Gujarat police Constable model paper 2018 pdf download, Gujarat police Constable practice paper 2018 pdf download, Gujarat police Constable old papers, IPC materials, CRPC law material, Kaydo material pdf etc. 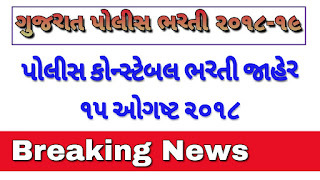 Gujarat TAT Gujarati official Answer Key 2018 - Today Gujarat secondary education board (GSEB) take TAT Exam 2018 successfully Gujarat TAT Gujarati official Answer Key 2018 Pdf Download: Gujarat Teacher aptitude test (TAT) has successfully taken by Gujarat State Examination Board (GSEB) in various Gujarat centers. There are large number of aspirants applied for TAT Exam 2018 and almost all candidates give written examination on 29th July 2018. TAT written exam 2018 for Teacher Eligibility Test conducted in different subject like Geography, Philosophy, Gujarati, Gujarati, Science, Commerce, Economics, Gujarati, History, Mathematics, social Science Upper Primary Teacher Tat provisional Answer key 2018 (Gujarati / Gujarati Medium) Various Languages or Bhasha TAT Gujarati provisional Answer key 2018 (Gujarati, Gujarati, Gujarati, Sanskrit) for Gujarati Medium. 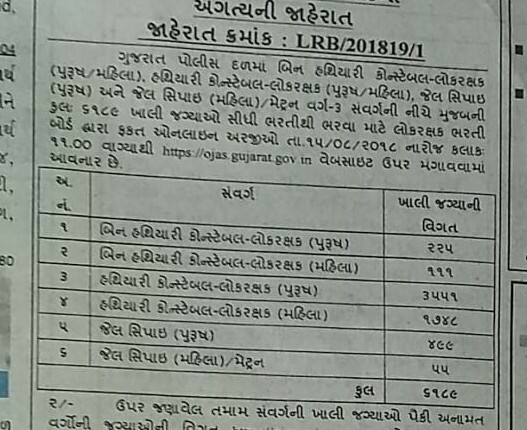 Maths & Science Upper Primary Teacher GSEB TAT Gujarati official Answer key 2018. Gujarat TAT Gujarati Medium official Answer Key 2018 Download : TAT Exam 2018 was scheduled on 29th July 2018. There are large number of students who had applied online for this recruitment of teacher post and most of students appeared in the Gujarat TAT Exam held on 29.07.2018 various regions in the Gujarat State. Now, students who give this TAT exam 2018 are looking eagerly for GSEB TAT Exam Answer key 2018. So here we provide the complete details regarding the Ojas TAT Exam 2018 answer key and TAT Gujarati official paper solution 2018 of the written test GSEB Gujarat TAT Results 2018. Gujarat TAT hindi official Answer Key 2018 - Today Gujarat secondary education board (GSEB) take TAT Exam 2018 successfully Gujarat TAT hindi official Answer Key 2018 Pdf Download: Gujarat Teacher aptitude test (TAT) has successfully taken by Gujarat State Examination Board (GSEB) in various Gujarat centers. There are large number of aspirants applied for TAT Exam 2018 and almost all candidates give written examination on 29th July 2018. TAT written exam 2018 for Teacher Eligibility Test conducted in different subject like Geography, Philosophy, Gujarati, Hindi, Science, Commerce, Economics, hindi, History, Mathematics, social Science Upper Primary Teacher Tat provisional Answer key 2018 (Gujarati / hindi Medium) Various Languages or Bhasha TAT hindi provisional Answer key 2018 (Gujarati, Hindi, hindi, Sanskrit) for Gujarati Medium. Maths & Science Upper Primary Teacher GSEB TAT hindi official Answer key 2018. Gujarat TAT hindi Medium official Answer Key 2018 Download : TAT Exam 2018 was scheduled on 29th July 2018. There are large number of students who had applied online for this recruitment of teacher post and most of students appeared in the Gujarat TAT Exam held on 29.07.2018 various regions in the Gujarat State. Now, students who give this TAT exam 2018 are looking eagerly for GSEB TAT Exam Answer key 2018. So here we provide the complete details regarding the Ojas TAT Exam 2018 answer key and TAT hindi official paper solution 2018 of the written test GSEB Gujarat TAT Results 2018. Gujarat TAT english official Answer Key 2018 - Today Gujarat secondary education board (GSEB) take TAT Exam 2018 successfully Gujarat TAT English official Answer Key 2018 Pdf Download: Gujarat Teacher aptitude test (TAT) has successfully taken by Gujarat State Examination Board (GSEB) in various Gujarat centers. There are large number of aspirants applied for TAT Exam 2018 and almost all candidates give written examination on 29th July 2018. TAT written exam 2018 for Teacher Eligibility Test conducted in different subject like Geography, Philosophy, Gujarati, Hindi, Science, Commerce, Economics, English, History, Mathematics, social Science Upper Primary Teacher Tat provisional Answer key 2018 (Gujarati / English Medium) Various Languages or Bhasha TAT english provisional Answer key 2018 (Gujarati, Hindi, English, Sanskrit) for Gujarati Medium. Maths & Science Upper Primary Teacher GSEB TAT english official Answer key 2018. Gujarat TAT English Medium official Answer Key 2018 Download : TAT Exam 2018 was scheduled on 29th July 2018. There are large number of students who had applied online for this recruitment of teacher post and most of students appeared in the Gujarat TAT Exam held on 29.07.2018 various regions in the Gujarat State. Now, students who give this TAT exam 2018 are looking eagerly for GSEB TAT Exam Answer key 2018. So here we provide the complete details regarding the Ojas TAT Exam 2018 answer key and TAT english official paper solution 2018 of the written test GSEB Gujarat TAT Results 2018. 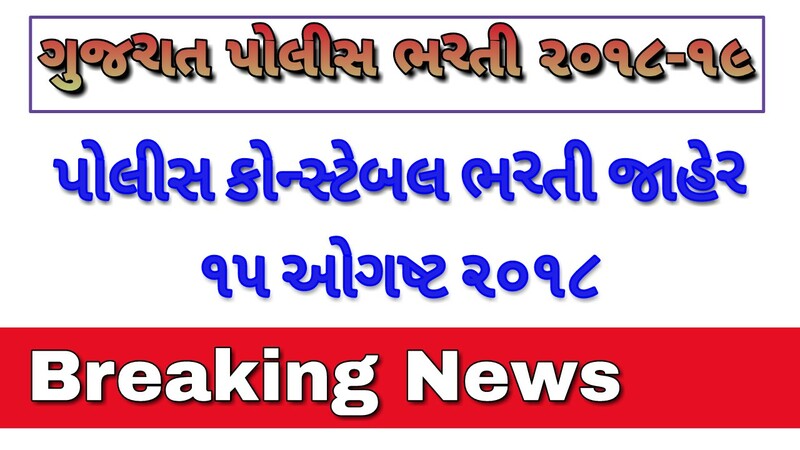 Gujarat TAT official Answer Key 2018 - Today Gujarat secondary education board (GSEB) take TAT Exam 2018 successfully Gujarat TAT official Answer Key 2018 Pdf Download: Gujarat Teacher aptitude test (TAT) has successfully taken by Gujarat State Examination Board (GSEB) in various Gujarat centers. There are large number of aspirants applied for TAT Exam 2018 and almost all candidates give written examination on 29th July 2018. TAT written exam 2018 for Teacher Eligibility Test conducted in different subject like Geography, Philosophy, Gujarati, Hindi, Science, Commerce, Economics, English, History, Mathematics, social Science Upper Primary Teacher Tat provisional Answer key 2018 (Gujarati / English Medium) Various Languages or Bhasha TAT provisional Answer key 2018 (Gujarati, Hindi, English, Sanskrit) for Gujarati Medium. Maths & Science Upper Primary Teacher GSEB TAT official Answer key 2018. Gujarat TAT official Answer Key 2018 Download : TAT Exam 2018 was scheduled on 29th July 2018. There are large number of students who had applied online for this recruitment of teacher post and most of students appeared in the Gujarat TAT Exam held on 29.07.2018 various regions in the Gujarat State. Now, students who give this TAT exam 2018 are looking eagerly for GSEB TAT Exam Answer key 2018. So here we provide the complete details regarding the Ojas TAT Exam 2018 answer key and TAT official paper solution 2018 of the written test GSEB Gujarat TAT Results 2018. We Know that All the candidates are waiting for Expected cutoff marks as well as the Final Results of Ojas Gujarat TAT Exam based on the given TAT Answer key provided by the Department of GSEB. So, all candidates who given TAT Exam 2018 can check their marks via un official TAT final Answer Key 2018 pdf download. If candidates have good score in TAT Exam 2018 can prepare themselves for the further selection process. Based on official Information sources the TAT EXAM RESULT 2018 will be declared after some time the completion of TAT Exam 2018. So department approximately provides the GSEB Ojas TAT Answer key of 29th July Exam 2018 on its official website from which it can download in PDF format. ITBP GD police Constable Recruitment 2018-2019 for 4126 posts and today we discuss all important information regarding ITBP GD Constable 4126 Recruitment 2018. Here www.GyanGujarati.com website provide complete information regarding Info Tibetan boarder police force (ITBP) Recruitment 2018 and ITBP Recruitment 2018 for 4126 job posts. Other details like age limit, educational qualification, selection process, application fee and how to apply are given below. so must read all details carefully and apply for ITBP GD police Constable Recruitment 2018 for 4126 vacancies. Eligible & Interested candidates can apply through online in Official website at @ssc.nic.in/ itbp Recruitment 2018.